Yesterday, I tried something I've never done before. I went for a scheduled 2-mile "easy" run and I tried to keep my heart rate in the recommended zone of 65-75% of the max. For me, that means 124-143 beats per minute. It was so much harder than I thought it would be! I was seriously running as slowly as I possibly could, and I was struggling to keep my heart rate under 150. I've been reading about how important it is to take the easy runs EASY, as they are meant to be. I also think that this will make me enjoy running more. If I know I can go out for a slow, lazy run, I won't dread it so much. However, if I do this, it means I really have to do planned speedwork every week--Tempo runs and interval training. I'm training for a 10k that is on October 9th, so I think I'll try training this way and see how it goes. From the way it felt, I could have sworn I was doing a 13:00+ minute/mile pace. 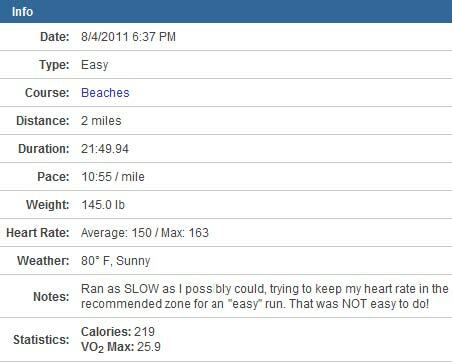 It's hard to imagine that when I first started running, the fastest I could go was about 13:30ish? And now I found it extremely difficult to run as slow as 11:00. It's fun to feel that progress! Yesterday was another food temptation I had to pass up. Whenever this one guy on the Detroit Tigers hits a home run, all the A&W's (around here anyway) sell coney dogs for 25 cents the next day. My kids wanted to go for lunch, so I took them to A&W. They each ate 2 whole coney dogs by themselves! I sat and watched. I went home and made a tuna sandwich, which held me over until dinnertime. I made lentil chili for dinner, which was really stupid of me, considering I planned on doing my run AFTER dinner. I ate 2 cups of it, which totaled 34 grams of fiber... so my stomach was cramping badly during my run. But I stayed on track all day and counted my calories. I didn't want to eat much after my super filling dinner, so my calories were a little low. Jerry was hard at work all last night typing a guest post for you. I think he was having way too much fun doing it. I'll probably post it tomorrow. 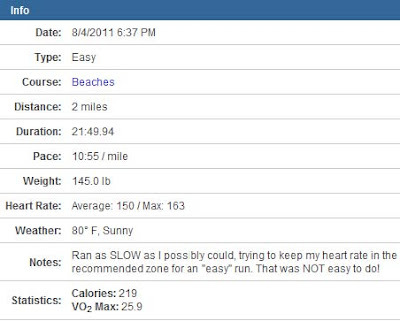 If you are a runner, do you run your easy runs and long runs much slower than normal? I don't know how you can do that--take the kids for something yummy and not having anything yourself. I guess I'm glad the kids are all grown up, altho sometimes I treat my grandkids to a Happy Meal. And...come to think of it...I don't eat anything from McDonalds...ever! But a coney dog...that's a little tougher than some cold fries or a McNugget. Can't wait to read Jerry's blog. Sounds like you're really doing well, both eating and exercise-wise. It's always good to have a run to train for (I would think), keeps you motivated. I have struggled the last few days with snacking on too many carbs, but the scale was at 147.6 this morning, so I'm happy. Time for my walk! Excited for Jerry's blog post! I'm proud of you for resisting temptation today! I think it's very awesome and selfless of you to put temptation right in front of you to make your kids happy. I remember growing up when my mom would go on one of her crazy diets my sisters & I would always be like "nooooo!" because we knew that meant no good food for us for a while! You're a good mom! I'm a runner but still fairly new at it (did C25K from March to May). I would say that for now all my runs feel hard. Lol. I don't wear a heart monitor but I could not carry on a conversation. When I do my once/week long run (I'm running my first ever 10k on 9/17, my 16th wedding anniversary! ), I'll run at an easy pace, about a 10 minute mile. My other runs are 30 minute runs to work on speed. I'll either do long intervals of a lap each, or I'll alternate 1 minute at 7.0 with 2 minutes at 6.5. I really like those short runs! I know I can do anything for one minute! It's getting through a 50 or 60 minute run that's the real challenge for me! AND no headphones allowed during the 10k! UGH! This Sunday my husband and I are running the Damon Runyon Cancer Research 5k at Yankee Stadium! The real challenge with this 5k is the amount of stairs we'll be climbing between all of the stadium concourses! I can't see breaking the 30 minute barrier on this one! I loved Jerry's blog! My husband's sense of humor is my favorite attribute of his.